In many parts of the US, wildfires are a constant threat. Wildfires destroy homes and property, injure and kill people and animals, and disrupt lives. We New Englanders tend to think of wildfires as only happening in the west, but that is not true. While less frequent and less damaging, there are indeed wildfires in New England. There are still some old-timers who remember a devastating Maine fire 70 years ago that destroyed towns and burned about a quarter of a million acres. People literally ran into the ocean to escape the flames. New England’s severe drought a few year’s ago was a prime condition for wildfires. 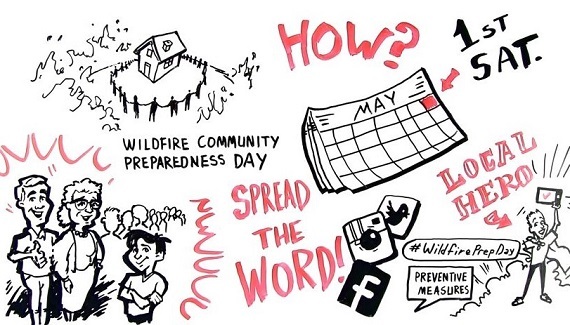 May 5, the first Saturday in May, is Wildfire Community Preparation Day. Wherever you live, it’s a great opportunity to pitch in and help your community prepare for wildfires and a good reminder to look over your family’s own fire-preparedness plan. So get the word out May 5: being properly prepared for wildfires is your best defense. Get the most out of your smartphone. Get community weather alerts. Install the FEMA app or sign up for the Emergency Alert System. The National Oceanic and Atmospheric Administration (NOAA) Radio also provides emergency alerts. Know your evacuation route, and have a plan B. And even a plan C. You don’t always know which exit will be passable. Make plans for your pets and livestock, too.Have your bug-out bag packed. Keep a number of N95 respirator masks handy. These sub-$20 face masks will alleviate the threat from inhaled ash, grit, and other particulates. Store your important documents in a fire-proof safe, and have password-protected back-ups of your data. Make sure the hose will reach. You want to be able to soak every inch of your property with it. Build with fire-resistant materials. Know the properties of the materials you’re using to build, renovate, and repair your home and outbuildings. Make a firebreak. Keep flammable material such as leaves, firewood, and debris at least thirty feet away from your home. Keep your insurance coverage up to date. If you’ve made renovations or additions to your property, let your insurance agent know. Go over all your insurance coverages with your agent once a year to make sure they’re up-to-date and suites to your current needs. Fire safety works best when everyone collaborates. Get together with your friends and family on May 5 and make your community safer from wildfires.